Too many marketers see “more content” as the answer to every content marketing problem. Not getting the rankings you want? Publish a new killer resource, informed by your latest keyword research and primed to draw backlinks. Want more social shares? Publish an asset that’s optimized to go viral on the merits of its snackable, interactive format, delightfully satirical approach and/or cute cats. But what if the problem lies deeper than that? “More content” won’t solve your problems on an ongoing basis if you continue to follow the same misguided processes as a default. Why rely on patchwork to fill in the gaps when you can plan to achieve goals like these from the get-go? A recent CoSchedule survey found that marketers who document their strategies and processes are four to six times more likely to report success than those who don’t. Given the clear importance of documentation, it’s crucial that you regularly update your strategies and workflows. Shifting your goals requires implementation guidelines and open communication, and making sure everyone on the same page is key. A strategy and process refresh can be a great quarterly housekeeping item. If any part is misaligned with your business’s current priorities, now is the time to correct it before your content veers too far off track. To make sure you’re creating great content from the beginning, follow these three steps. The first step is to make sure your content plan is still aligned with your latest business strategies and priorities. Depending on how frequently you do this, you may have pivoted other areas of your business without updating your content strategy to match. This is where you look at where content fits into your buyer’s journey. Identify each step people take in your funnel, interacting with your content at various touchpoints and channels. What are the key content assets that help transform people from being strangers to visitors to potentially interested – and everything else after that? It’s important to define the specific actions that are required for each funnel stage, how each touchpoint leads to the next. For example, you’ll need to map how your social media channels will support your ungated content, and how those pages will convert audience members to leads if that is your goal. You should use content to achieve your goals at every stage of the funnel – not just traffic acquisition or brand awareness. It can attract an audience, convert fans into customers, or build customer loyalty and retention. Look at your current overall KPIs like leads, new sales, retention rates or total revenue, for example. Then set an ambitious yet achievable goal for the performance of each of your content types, media channels, and campaigns. This is where your content marketing strategy first starts to take shape again. Once you’ve decided what your new content plan will accomplish and how it will funnel people through their journeys, you’ll have the information you need to calibrate the rest of your strategy. Now it’ll be far easier to know what audiences you need to target, and what types of assets you’ll need to attract, nurture, and convert them. The next step is to identify the content you’ll need in order to appeal to each of your various buyer personas at each phase of their journeys. In this sense, your target audience for individual content platforms or topics will represent segments of your overall audience. For example, blog content that targets a manager buyer persona at the top of the funnel will have different goals, tone and talking points from your email sequences nurturing executives getting ready to buy. 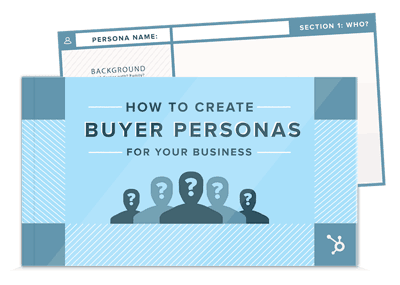 If you’ve never built out complete buyer persona profiles for your target customers, now is the time to do so. Conduct research – both qualitative and quantitative – on your existing audience and customers as well as whom you’re trying to specifically attract. Keep in mind that these persons might or might not be already finding your assets where you want them to, and you might or might not have developed assets primed to appeal to each of them at every phase. Find those gaps, add them to your “to be developed” list, and move on with your audit. Take stock of how your personas already interact with your brand’s content, such as if they read your emails or blog posts – or if they take any action after reading. Also, make sure to talk to them directly, so you can find out what they’re working on or struggling with, what they want from you, and what problems you can solve. Focus on that person that your content assets will be specifically targeting at every turn. According to data from Aberdeen, marketers who use personas and map content to the buyer’s journey see 73 percent higher conversions than those who don’t. It’s also a good idea to run experiments with your brand messaging efforts to help determine what resonates with the people exposed to it. This can help refine your understanding of your audience even further. But in the same manner that structured frameworks are useful for content planning, you’d likewise be smart to map out your branding experiments. Once you’ve defined how your content will move people through your buyer’s journey, it’s time to schedule the execution of your new plan. This stage basically entails setting up and populating your editorial calendar. Your overall marketing calendar breaks down the execution of your bigger plan. What will be created, when, by whom, and how will it be promoted? Start by planning overall promotions, campaigns or themes for a chunk of time, such as the full quarter or year. Then break it down into individual pieces of content and topic buckets based on what you know about your target reader. The individual target persona and journey phase for each piece of content. An SEO plan with target keywords and metadata. Supporting visuals for on-page use and external promotion, each optimized for the channel where it’ll be used. A distribution plan, including an outreach list of allies who can help amplify your efforts. Promotional copy for any social media posts, emails, or ads. Not everything above needs to appear in your editorial calendar months in advance, but proper planning does necessitate sorting it all out. And the more you sit down and intentionally plan out, the easier things will be to execute correctly and in line with your business goals. 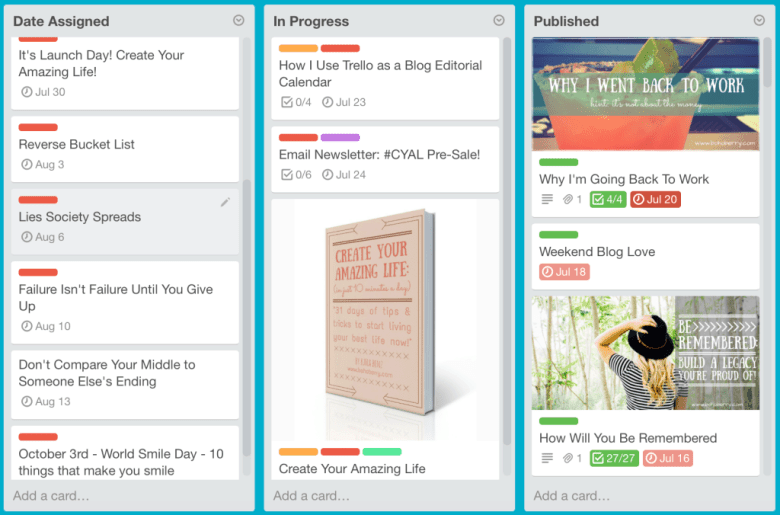 Solopreneur Kara Benz, for example, has worked out a great system for using Trello’s checklists, labels and calendar views as an editorial calendar and workflow management system. But the solution you use doesn’t need to be so fancy. There are plenty of simple templates that you can download to get started planning, such as this spreadsheet. Just customize it and add relevant columns to plan out each aspect of your process and division of labor. When is each task or piece of the project, such as design or promotional info, needed by to keep everything on track? With the above in place, you’ll have a clear workflow to follow when it comes time to finally begin the content creation process. When you’re living in the trenches, it can be hard to maintain the proper perspective. To create a successful content marketing program, everything about it needs to stem from your overall business goals. Start there, then work through planning out how content will interact with your customers throughout the buyer’s journey. By considering the overall picture before drilling down to specific pieces of content, each piece will be designed to make an impact from the start, and you’ll be exempt from plugging up the holes as you go.